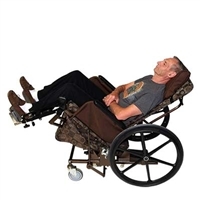 The Serenity Tilt-n-Space Glider takes the standard Tilt-n-Space chair to a whole new level of comfort. The gliding feature has a calming and soothing affect for the individual. effortlessly. Volaro Divided Leg Sling is designed so that it can be applied to an individual while the person is in bed or in a seated position. The Volaro gait trainer sling is designed so that it can be applied to an individual while they are in a sitting position. Once attached to a ceiling lift or our non-arching beam full body lift, you can lift someone from sitting to standing with full support from the sling. The weight of the person is transferred to their legs by the leg cuffs. 10 Year Warranty - Durable Construction Customize your comfort with Rock-King’s fast, easy tilt and height adjustments that can be tailored to fit each individual.